I’ve just completed my latest addition to my “Le bon Dieu est une femme” (The good God is a woman) collection. As noted in the previous post, this collection will feature paintings and sculptures that pay homage to the beauty and complexity of women. I find that, as I am creating each piece, my mind revisits the many women who have impacted my life. Each leaving her own lasting impression and lessons. Women have a way of shaping the world around them. I hope that the pieces of this collection will inspire others to recall and appreciate the way the women who are in, or have passed through, their lives have helped to shape them as well. 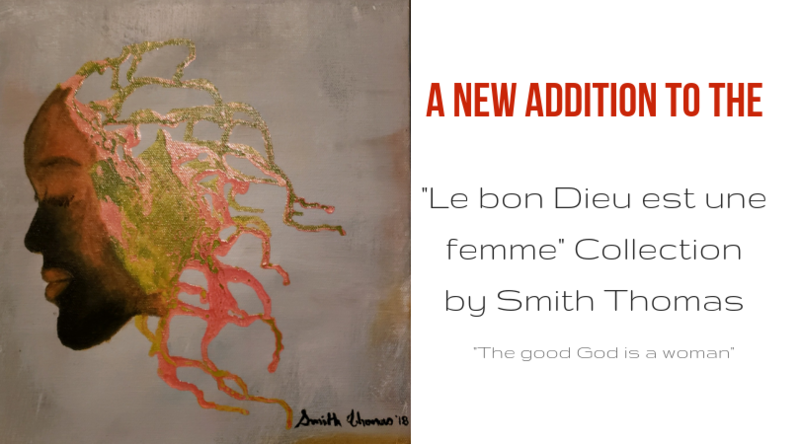 Smith Thomas is currently working on a new collection entitled “Le bon Dieu est une femme” (The good God is a woman). 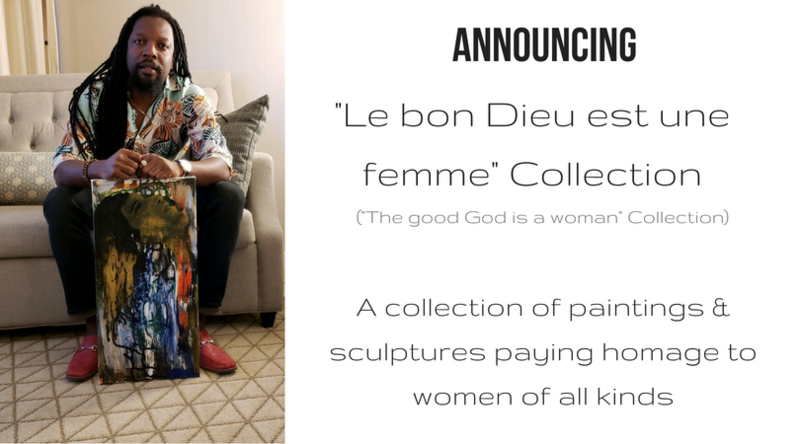 The collection will feature paintings and sculptures that pay homage to the beauty and complexity of women. Watch this site for updates on new additions to this beautiful collection. 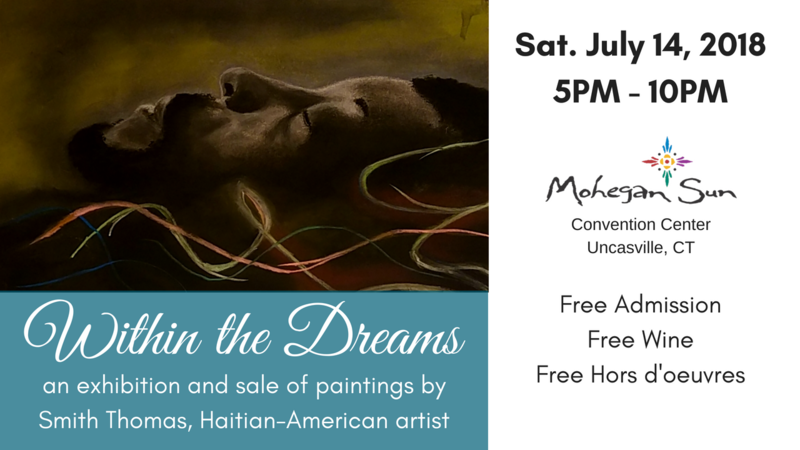 I am excited and honored to be doing a solo art exhibition and sale at Mohegan Sun Casino in Uncasville, CT. 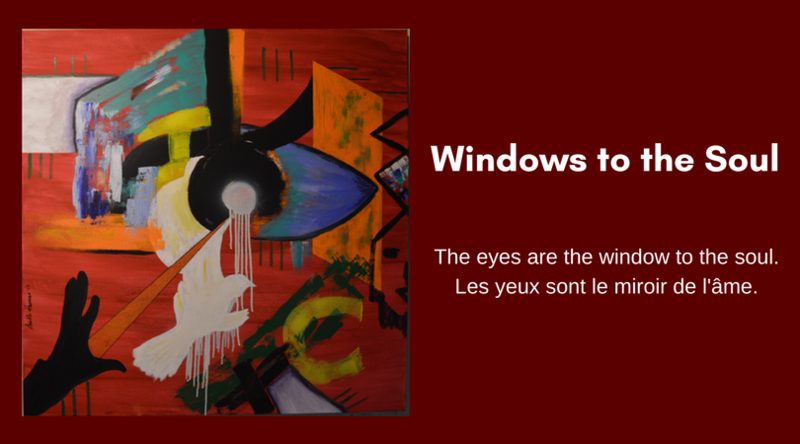 The show is called “Within the Dreams” as it is a curated collection of pieces that started as my daydreams, night dreams, memories, nightmares, and fantasies. Please watch this video about the show and share with your friends and family. Why: Great art, great company, great wine, food and music! 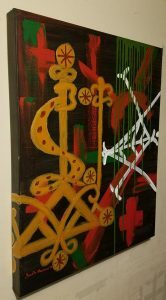 Also, a portion of profits from all paintings sold will be used to purchase art supplies for school children in Haiti. Cost: NONE! Free admission. Free wine. Free food. Free music. I look forward to seeing you on July 14th! The painting will be part of their upcoming tribute exhibit to Ellis Ruley. 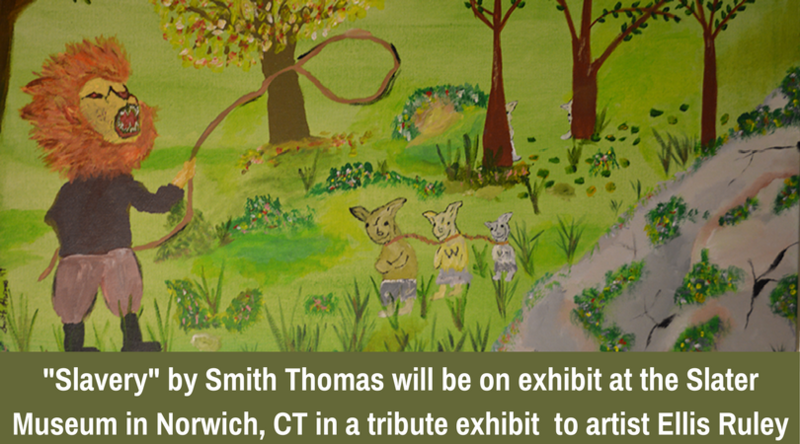 Born into the first “free”generation in his family, who lived in Norwich, CT for most of his adult life, and became an acclaimed folk artist. I am posting below, a research paper I wrote about Ruley and his work so that you too, may come to appreciate the man and his art legacy. To understand Ruley’s art, you must first understand his life. His was not an easy path. Just one generation removed from slavery, Ellis Ruley was born in Norwich, Connecticut in 1882. The Ruley family legend claims that Ellis’ father, Joshua, fled from Delaware and hopped on a northbound coal boat – ultimately “swimming up the Thames River” and becoming the first runaway slave to live in Norwich. Ellis Ruley’s mother, Eudora, came from a slave background as well and, according to the city of Norwich, was also a member of the local Narragansett Pequot Tribal Nation. She entered her marriage to Joshua with five children in tow. Together, Joshua and Eudora had seven more children making a total of 12 – one of whom was Ellis. As was usual for black families in the area at that time, they lived in poverty. Ellis’ first wife miscarried at least eight pregnancies and eventually gave him a daughter. The marriage ended and nearly 20 years later he married again. This time to a white woman who was previously married to Ruley’s own brother. Interracial marriages were scorned at the time – especially in a town like Norwich where the KKK had a strong presence. Making matters even more difficult for him, Riley was in a work-related truck accident in 1929 and eventually received a $25,000 insurance award. He used that money to purchase a broken down farmhouse in a white neighborhood, thus increasing the contempt his white neighbors felt toward him. 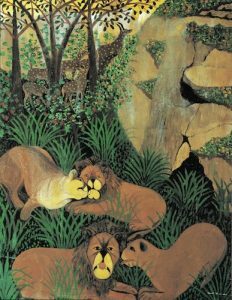 In spite of his white neighbor’s objections to his presence in “their” neighborhood, this land became Riley’s sanctuary and it was there that he found peace in painting. Using cardboard, card table tops, Masonite, and poster board for his canvas and house paint as a medium, he created paintings that combined nature and figures. While his own land inspired the nature-based settings for his paintings, Ruley typically used photographs from magazines as inspiration for his figures. By using these photographs as his “muse,” a man who had lived his entire life in a limited geographical area and always with a sense of impending danger, was able to wander the world where he found a sense of adventure, peace and tranquility, and capture it on his canvas. Described as an Outsider Artist and Folk Artist, Ruley was both. 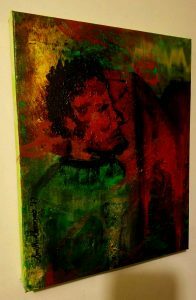 He was an Outsider because he was self-taught and worked with little awareness of how things work in the sometimes stuffy world of art. He was a Folk Artist because he worked in cultural isolation and created works with bright colors, flattened perspective, and simple arrangements that are so much a part of the style. Indeed, every human figure painted by Riley has basically the same face and, when one looks closely, even the animals have the same eyes as the humans. He taught himself one way to create and applied it throughout his works. Ellis Ruley’s “Grapefruit Picking Time” is an excellent example of his style and preferences. Women were a favorite subject for Ruley, so it is no surprise that the main focus of this painting is six women who are picking fruit in a grapefruit grove. They are all wearing brightly colored dresses in shades of red, gold, and blue. Typical of Ruley’s work, their faces are strikingly similar with wide-set almond shaped eyes, broad noses, and downturned mouths. As with most of his works, the women have a variety of hair colors, but their skin tones are identical a very pale. Though Ruley was black, it is very rare to have darker skinned figures in his paintings. 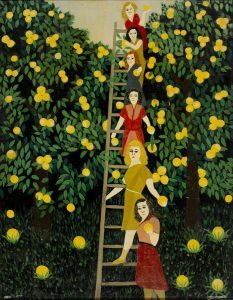 There is a ladder leaning against a fruit tree and five of the women are on the ladder at various heights, and the sixth is on the ground. Each woman is holding a single fruit and is turned to face the viewer. The background consists of lush leafy foliage on the fruit trees, green grass, and hundreds of bright yellow grapefruits. This painting, like many of his works, uses repeat patterning with many of the fruits clustered in bunches of two or three and repeating over both trees in that manner. In spite of his self-taught roots, Ruley has a good sense of scale and proportion. In this painting, this is evidenced by the decreasing heights of the woman as they are farther up the ladder, and in the spacing of the ladder rungs themselves as the steps appear closer together as they grow more distant from the viewer. The artist uses several different hues of green to effectively build a feeling of depth into both the trees and the grass. He also adds a spot of lighter shade of color to the grapefruits to give them a feeling of roundness. Ruley lived his entire life in the northeast corner of the United States, and never saw a grapefruit grove, yet he is able to transport himself and the viewer into a grove that is so lush you can feel the warmth, smell the fruit, and hear the voices of the women. As I look through his body of work, I can’t help but feel that painting was the artist’s escape. In a world where he was trapped by his skin color, poverty, the Great Depression and other factors, he was a man who found a way to escape through is paintings. Though only about sixty of his paintings are known to have survived a suspicious fire that burned his home shortly after his suspicious death, his family reports that he had created over two hundred works… two hundred adventures. 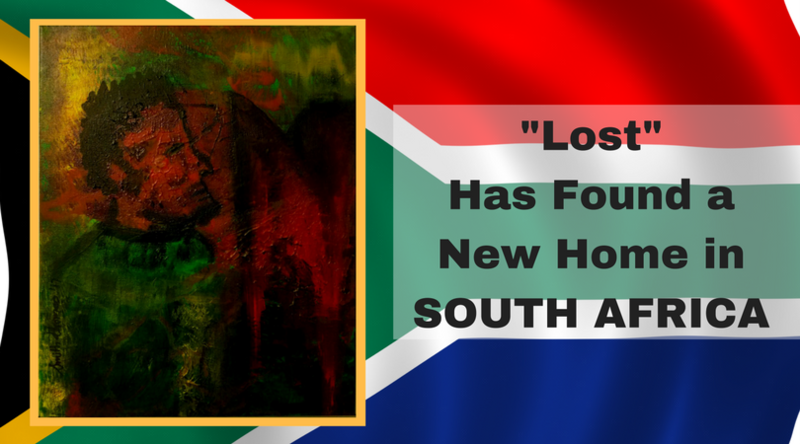 “Lost” Has Found a New Home – in South Africa! 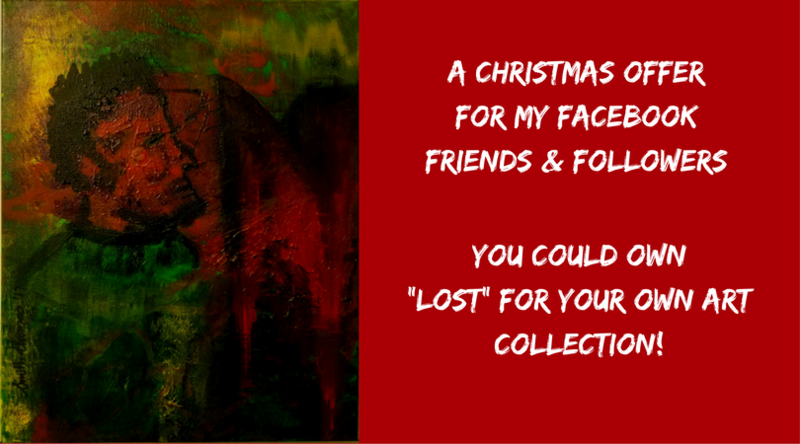 Thank you SO MUCH to everyone who made an offer on “Lost” – my painting of a man in search of something. I am deeply moved that so many of you like my work enough to want it for yourself. Ultimately, the high offer was for $395 and I am thrilled to report that Lost can now be “found” in South Africa! 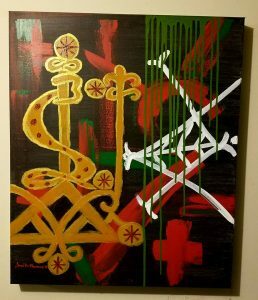 It is my sincere hope that each of you who contacted me about this painting will continue to follow my work and that you’ll always feel welcome to make an “offer” on any of my paintings. Happy new year to you all thanks for your support during 2017 and it is great starting 2018 with people like you around my art. Your Chance to Own “Lost” and YOU Name the Price! 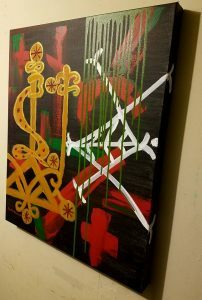 In the spirit of the holiday, I would love to make my work more available to you! I have just finished painting Lost (acrylic on canvas; 11 x 14 inches) and I would love to have it go to one of my Facebook friends! From now through December 31, 2017, I am going to let you “make me an offer” on Lost. On December 31, at 10PM (US eastern), I will review all of the offers and Lost will go to the person who has made the highest offer. I will pay for shipping within the US and Canada, but buyers outside of North America will be asked to pay for shipping in excess of $US35. 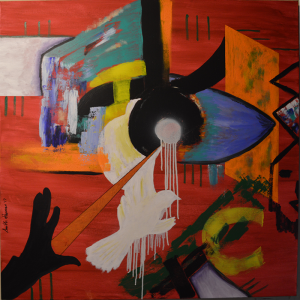 Please send your offers to SMITH@ANARTPIECE.COM . I will reply to all emails to acknowledge receipt and to answer any questions you might have. 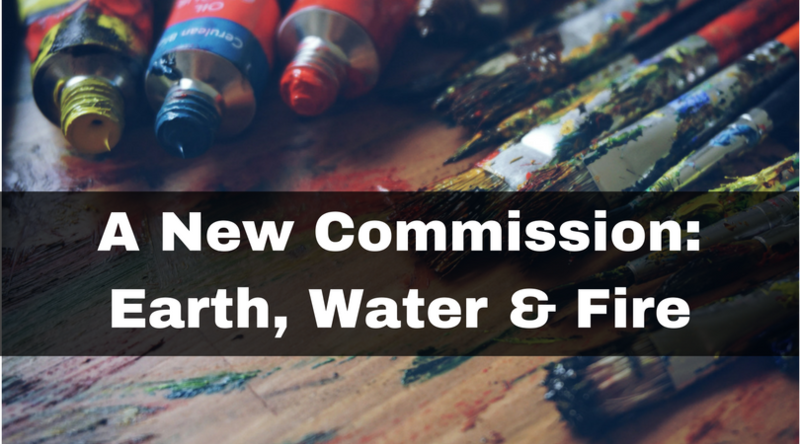 I am delighted to announce that I have just been commissioned to create a 3-painting series for a client in Greenwich, CT. While I have agreed not to mention his name online, he is a well-known patron of the arts and my paintings will hang among some prestigious artists. The client initially wanted to purchase all three pieces in my Web District series (viewable in the Gallery), but has opted instead to have me create a similar series that will complement the decor of his home theater room. Each painting will embody an element of nature – Earth (with natural tones of umber, clay, sienna, etc. ); Water (with shades of blue, white, and silver); and Fire (with shades yellows, oranges, reds, and black). I am excited to dive into this new project and, if the client permits, I will post photos here for you to see. 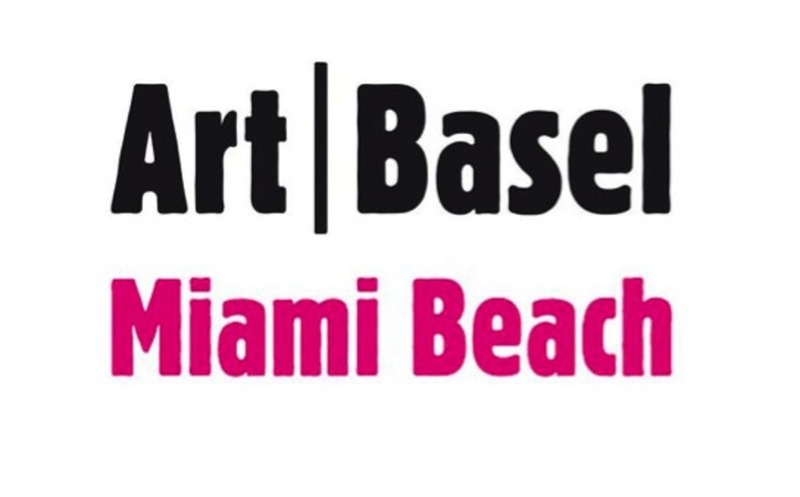 I just arrived in Miami for the 2018 Art Basel and, even though I am tired to the bone because I have been up for about 27 hours, I am so happy to be here. In my own words (based on what I saw at last year’s show, and expect to see this year), I would simply describe the experience as AWE-INSPIRING. As an artist, I admire and inspired by so many different types of work – regardless of whether they are in a style that is similar to my own or not. While I am here, I’ll also be visiting the Wynwood Art District again. With over 70 galleries, museums, and collections there is something for everyone! I’ll keep you posted on my Facebook page and share some of my favorite pieces with you there!